Pregnancy or Maternity Pillows are a very recent phenomenon, so much so that calling their entry into the market a “phenomenon” would be an exaggeration. Nevertheless, mothers (and fathers too, thankfully) all over the world are now getting warmed up to the idea of sleeping on a maternity pillow during the later months of pregnancy. Traditionally, women used to use the normal pillow to place between their legs and all around themselves, all in a bid to accommodate the new pregnancy curves and hopefully get a few hours of comfortable sleep. The modern Maternity Pillows are an extension of the traditional pillows, in that they are carefully designed and shaped in such a way that they give a much needed support to the back, belly, hips as well as legs and knees. This helps in achieving a very comforting posture, that helps in alleviating the aches and pains brought upon by the changes in human body due to pregnancy, and helps expecting mothers finally get that much required good night’s sleep. Typically, a mother begins using a Maternity Pillow when the pregnancy curves become noticeably and big enough to cause discomfort in lying down (both on your stomach and your back). But a Maternity Pillow can prove to be useful even after the baby’s delivery in establishing a good breastfeeding relationship between the mother and the baby, by helping to position the baby correctly as they learn to latch and nurse properly. Material – The ideal material used in maternity pillows is memory foam, look for it while buying one. A memory foam filled pillow takes the shape of your body and does not lose shape over time and regular usage. Shape – Look for a pillow which follows the shape of your pregnancy curves as closely as possible. 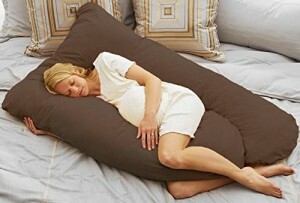 A maternity pillow must have a definite, designated place for the belly and the legs. Fabric – During the later months of pregnancy, your body will generate a lot of energy and heat and you will sweat profusely day in and out. Therefore it is advisable to opt for a pillow that is only made of pure Cotton (synthetic and texture fabrics are a strict no no), as it helps to regulate body temperature and does not absorb heat as much as other fabrics. This particular pillow was developed by a registered nurse and a mother, and the same shows in the excellent design and its huge popularity as the best maternity pillow available in the market. The unique ‘C’ shaped design of the Leachco Snoogle pillow offers excellent back support and can be tucked easily between your legs to alleviate that lower back pain. This was developed after mothers complained about Leachco’s previous bestseller, the Leachco Back n’ Belly Contoured Body Pillow becoming too warm when slept it. However, even though the Snoogle is considerably cooler than the Back n’Belly, it can prove to be a bit of underwhelming for taller women who may be unable to use the bottom part of the ‘C’ to relieve their belly weight. This is the only real competitor to the Leachco pillows, with a similar ‘C’ shaped design and its ability to stay cool even when the air-conditioning is switched off. The Safra Maternity Pillow uses shredded memory foam as the stuffing material, and a 100% cotton pillow case to ensure that the body heat emanated does not stay trapped and the fabric feels soft enough to sleep upon. The only drawback with this product is the same one that every C-shaped pillow has, you cannot turn comfortably from one side to another during your sleep because the belly weight will need some adjusting while doing so. This is termed as the Cadillac of Body Pillows, and if you are in no mood to go through dozens of reviews or in a tearing rush to buy one, we can give you our word that this pillow will satisfy all your needs. 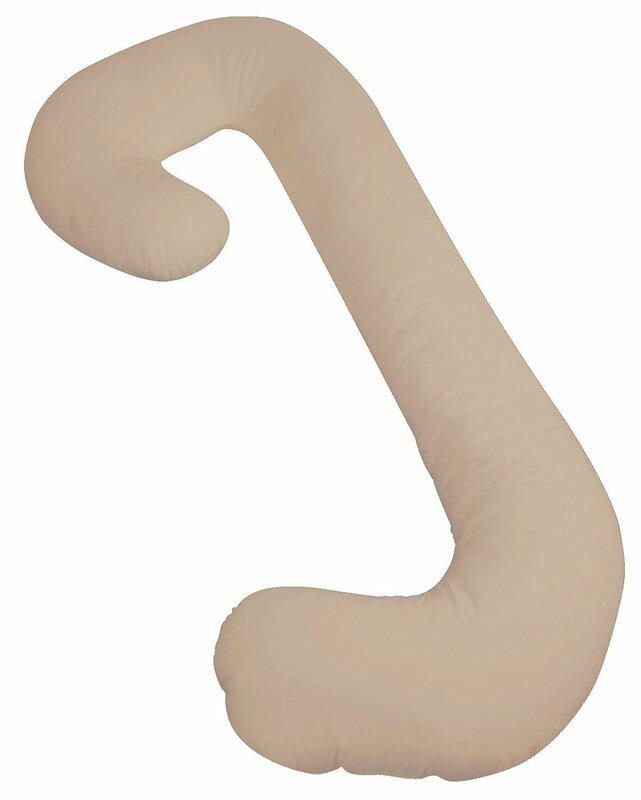 This Leachco body pillow features a U-shaped design and is big enough, so that you can twist and turn all you want in your sleep, the Back n Belly will give you perfect comfort and support in every position. It has a slightly higher head support area, which casts away the need for your regular pillow completely and the sides of the pillow are firm enough to carry your belly weight as its size grows. There are little ‘wings’ on the inside of the sides, which provides additional support to your weighty belly at all times of the pregnancy period. However, this pillow is usable only if you own a king size bed or else your partner will have to sleep in some other place. There is another flaw with the pillow that it tends to get a bit warm, no thanks to the 35% cotton, 65% polyester combination in the pillow case fabric. This is another excellent product from Leachco. It features the same C-shaped design, but has a lower head support part, which makes it more comfortable and ideal for mothers who do not want a high pillow. The Snoogle Chic Total Body pillow also features a very thick and longish bottom part than the Leachco Snoogle Total Body Pillow, and so it works well enough for the taller women as well. The cotton pillow case is made of 60% Cotton and 40% polyester, so that is where you may feel a bit let down by this otherwise excellent pillow. This over-sized product from Today’s features a unique U-shaped design which conforms to the pregnancy curves of your body, and provides that overall, extra support. The large size of this pillow may be a deterrent for a lot of women, as this pillow is actually large enough to be a kid sized mattress, but the “Legs” on this U-shaped pillow are the saving grace and can be positioned in any which way to provide you with utmost comfort. 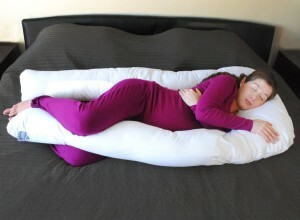 Also, this is the only full body pregnancy pillow which comes with a brown, blue, beige or white pillow case, thus offering a choice of colours to the would be parents. Blowout Bedding is a newcomer in the pregnancy pillow market, but their products have already carved a good image among other brands. 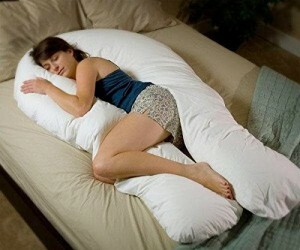 Unlike the over-sized pillows, this one is U-shaped and contours to the natural curves of your body. At 60″ long and 30″ wide, this is still a large pillow and is able to provide ample support to your entire body. The only problem is with the low head support part of the pillow, which is too low even for women who prefer lower head support on their pillows and you might have to use a regular pillow on top of it. However, it does feature an adequate belly and leg support and at a very low price ($35.00), is certainly a good option to consider. 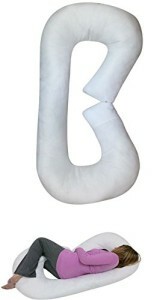 The Khomo extra light pillow is actually an extra light maternity pillow with a U-shaped design. While most of the maternity pillows on this list tend to be on the bulkier and heavier side (not to mention the oversize), the Khomo is a welcome change in the market of maternity pillows. The extra lightness of the Khomo means that it becomes very easy for mothers to switch positions at night, and they wont have to wake up their partners to help them change sides or positions. The Boppy Custom Fit Total Body Pillow was designed by a physical therapist and he came up with a unique, 3-piece design that provides ample support in the areas you need most – neck, belly, back, hips and knees. The head and neck support part is as soft and comfortable as any regular pillow while the lower part (belly and leg support) is firm enough to relieve the belly weight from your body. The only limitation to this wonderful product is that it does not come as a double or with a U-shaped design, which would have allowed mothers to turn any side they wanted while sleeping, and still get the same level of support to their various body parts. The Comfort U Total Body Support Pillow by the Moonlight Slumber company is the most expensive product in this list, and not without solid reasons. It is one of the most comfortable pillows in any category or price range and is extremely durable, while it is also flexible enough to be contorted into any shape and position as required. The Comfort U pillow offers support for the entire body with right amount of firmness and softness to support your head, belly and legs. It is made up of an innovative material known as “the extended polymer or Fusion Fibre”, which allows air to flow freely and it will never flatten or break up into lumps and clumps. The extended polymer material also helps in letting out heat, allowing it to be cool enough during all times. The grandmother of all maternity pillows, called so because it is one of the best of those old school maternity pillows still remaining on every shopper’s wishlist. It comes in a rather small size, so if you are an average height woman or like to sleep in the fetal position, this is a very good option to consider. However, it does not allow for a lot of variance in your sleeping position and so, every time you change side or position, you will have to readjust the pillow. Like all the other pillows in this list, the Boppy Body Pillow is also completely machine washable and can be removed using a zip attached in its cover.